Years ago, a friend of ours came over and made dinner for us. At this dinner, he made a soup that was amazing….amazing and so incredibly simple. I make this quite often, and keep forgetting to snap a picture before we devour it. First bring a pot of water to boiling. Salt it heavily, about 2 tbsp worth of salt. When the water has been brought to a full boil, add the broccoli in. Let them boil about 3 minutes until bright green and just done. Don’t let them boil too long or they will get soggy. Transfer the cooked broccoli into a blender with just a little water from the pot. Blend. If too thick, add more of the cooking liquid. You want the consistancy to be soupy but not babyfood. 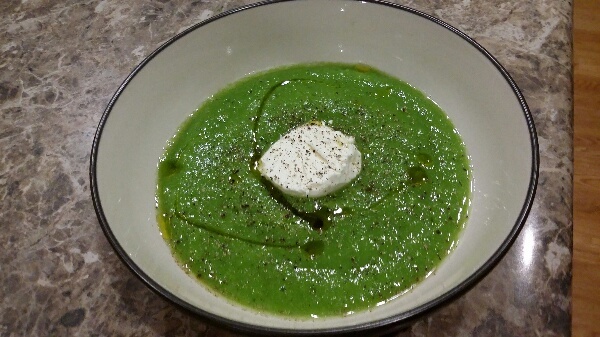 Put 1 oz of goat cheese in the center of each bowl, and pour the soup around it. Drizzle a little olive oil and pepper to taste. Enjoy immediately.